Truk Lagoon is home to magnificent ship reefs, each with its own unique marine life. The beautiful Truk Lagoon is one of the legendary places that every diver wants to see, but few can due to its remoteness and the expense of getting there. It was explored in the 1980’s, and houses some of the most amazing shipwrecks. Divers call them “ship reefs” because the upper areas of the wrecks are covered in soft corals. Many of them also have hard corals growing on the deck and the bow areas, with clouds of fish surrounding them. Some of the wrecks settled in shipping channels and these channels have currents, bringing in sharks, eagle rays and barracuda schools. The Fujikawa Maru is also home to a large school of Jacks that like to hang around the anchor chain at the bow. Truk is commonly misconceived as a deep-diver’s paradise and mainly for the so called “wreck-heads”. However, many of the dive areas are only 15 to 30 meters. So anybody that wants to see marine life, even if you’re not a wreck head, you can go onto these wrecks and be pleasantly surprised. Some of them even have good mackerel, and nudibranchs so if you have a diving partner that isn’t really that crazy about shipwrecks, they are going to be just as intrigued by all the corals and the exquisite marine life in and around the wrecks. Liveaboards of Truk are like floating hotels with easy access to a variety of shipwreck dive sites. Taking a dive trip on a liveaboard can be one of the best ways to see the shipwrecks of Truk Lagoon. Each wreck is a quick boat trip away, and divers can get a variety of dives in one trip. Each day starts off with a dive at a deeper shipwreck site, and continues to shallower dives as the day progresses. One of the most popular wrecks to dive include the Nippo Maru where you can see eagle rays and Barracuda schools, and an incredible marine life. There is also a tank on the wreck and trucks, giving a real war feeling, including spotting some field artillery guns. The bridge on the ship is really beautiful and the old ship’s wheel has a lot of sponge growth on it. Usually there is also a lot of small baked fish inside the upper part of the bridge to be seen. Not only is it photogenic site, but it is kind of exciting and just deep enough that you feel like you are really down there on an exploration. Truk brings an adrenaline rush with various shark dive sites for the brave of heart. Many of the liveaboards also take divers out to specific sites where they can encounter grey reef sharks, white tips, and silver tips. Areas such as the South Pass has many grey reef sharks and the occasional white tips and silver tips. Another popular area is called Shark Island, located near Weno Island, where there is a cleaning station. The grey reef sharks circle in around 11 o’clock in the morning through the cleaning station, and often times follow divers back to the liveaboard. This is a great place to do shark photography and be almost guaranteed some unusual shots of these amazing creatures. All wrecked out? The variety of marine life on the Truk reefs leaves no one unsatisfied. Although the State of Chuuk is a rather poor island and the local people rely on their fishing as a source of life, many of the areas are still well protected due to the remote location of the islands. For those who are “wrecked out”, the sanctuary-like marine life provides more than expected. On some of the smaller islands there are beaches where you will even find turtles and breeding sites and many little reefs scattered around. Truk Lagoon may not be a marine preserve area, but it is so rich with varying terrains and diversity that there is a lot of marine life to see. There are even some places that have mandarin fish, and incredible reef areas all around. Blue Lagoon also has private islands, with the most popular being Jeep Island, a tiny island with about 15 coconut trees. It is a beautiful place to spend a few days, totally away from the wreck experience. Near Jeep Island, divers can swim with bottlenose dolphins in the summer time, take snorkel trips to see the enormous patches of staghorn coral, and observe the marine life, such as chromis fish, in the beautiful coral garden on the side of the island. The wrecks of Truk Lagoon bring to life the rich history of the area, and wars that were had. 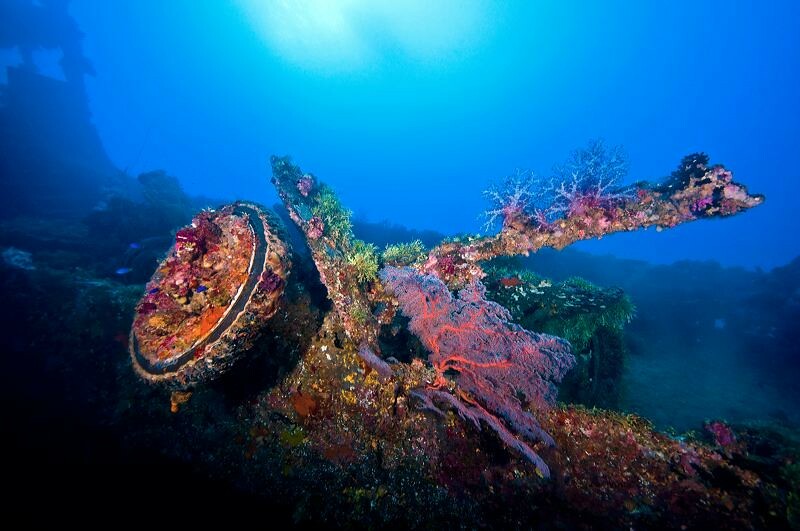 Some of the wrecks bring a particular war history to life, as boats are filled with old tanks and ammunition covering the holds. It is obviously important to remember that all of these wrecks are still war graves. In some cases, gas masks and human skulls can be spotted. However, many of the lost sailors have been retrieved by the Japanese repatriation teams. They came down in the late 80’s to give proper burials to those who were lost in the war, and brought the ashes back to their families in Japan. The Oite Destroyer is one wreck that remains occupied by lost soldiers. The wreck sits at 220 feet deep, so very few divers visit this area. The Oite was a small ship, and as they were trying to leave the lagoon they passed another ship that was sinking. The crew from the Oite took all those sailors aboard, so when it was finally sunk there were two full crews laid to rest along with it. To remember these brave sailors, many of the ships have small monuments placed on them to remember the crew. There is also one on the Fujikawa Maru to remember Kimiuo Aisek who was the pioneer diver of the Truk Lagoon. These monuments are a reminder to all who encounter the wrecks, and the fact that they are war graves is not forgotten. Consider weather and visibility when traveling to Truk to dive. Because there are so many islands in the area, you can hide behind them to get away from the wind. However, the trade wind season runs form December through May in Micronesia and the winds like to whip up a little bit in March over in the Truk area. But on the whole, diving in Truk can be done year round. Keep in mind, if you want to get out to some of the further wrecks, you need a flat ocean. Starting in June and then heading in to August and September especially, it is the rainy season. So you might get a little wet, but usually the lagoon is glassy flat. These are perfect conditions to get out to see the further islands in the Western Passage and even out to Tol to dive the Hanakawa Maru. For those who want more calm conditions, the recommended time is in September or even into October. The only drawback would be the rain. In regards to visibility, it can be quite changeable depending on the location of the specific wreck. Some are located in passages, while others are closer to mangrove areas. The Heian Maru and the Kansho Maru are both fairly close to some mangrove areas, so you might find them a little siltier and the visibility a little bit lower. Then as you get down by the south pass, there lies the Sankisan and Rio De Janeiro. They are usually crystal clear all the time because they get a big tidal flow coming in and out of that pass. To liveaboard or to stay land-based? The decision lies with your preference. There are two well-known liveaboards that host divers throughout the Truk Lagoon area. The Odyssey tends to accommodate the more technical diver, so if tech is your preference The Odyssey would be a great accommodation. The Thorfinn offers a package deal, so if your idea of diving is getting to as many wrecks in one week as you can, then the Thorfinn package would be the best place to stay. Then of course there is also the land based option. Many prefer this because it allows you to do just about any wreck you want, depending on the day. The two main land based accommodations would be the Blue Lagoon and The Truk Stop Hotel. Blue Lagoon is the old Continental Hotel grounds and has a beautiful setting with palm trees all around a big area. The Truk Stop Hotel is located right in town, so it presents a convenience factor. They also have a little pier and a bar called the Hard Wreck Café and Bar that creates a great atmosphere for travelers. The waves of time will determine how long the wrecks outlast the nature of the sea. One of the main factors determining the longevity of the shipwrecks are the waves and the storms. The ships have lasted quite some time because most of them are located within a protected area, away from the outer reef and never ceasing waves. Some of the ships were converted into freight and warships built in the early 1900’s. They are made of strong materials, the craftsmanship was good, the metal was high quality, and the proper time was taken for them to be built because many of them were passenger ships before they got converted. Some of the newer ships were built pretty quickly. The metal that was used for them was not at the same level of quality and are more likely to see the stress of time, collapsing before the others. There are already two currently in that state, and at least one has practically fallen apart. Even the famous gun ship has lost it’s gun, that has now sunk to the bottom. In most cases, the wrecks last longer when the marine life is healthier. It acts as an outer coating that holds everything together. So as long as people keep protecting the wrecks and not anchoring on them and letting the marine life and the corals grow together, it fuses the ship and eventually becomes a reef. So get out to see these wrecks and do not worry too much about the time table. Just know that the Truk Lagoon really is the best of both worlds. If you are really into wrecks, explore the ships with all of their lost artifacts. If you are really into reefs, well then just swim above and follow where the corals are and you will have an amazing dive. [0:00:07.0] CM: Hello and welcome to Dive Happy, the podcast about the best places to go scuba diving in Asia. I’m your host, Chris Mitchell and my guest for this episode is Tim Rock, veteran underwater photographer and author of The Diving and Snorkeling Guide to Truk Lagoon, recently updated and published in 2016. Tim, welcome back to the podcast. [00:00:27.2] TR: Chris it’s a pleasure to be back, good to talk to you again. [00:00:30.0] CM: Thanks, mate. So, Tim, Truk is one of those legendary places that every diver wants to see but few can due to its remoteness and the expense of getting there. In fact, it has a bit of a legendary thing in my own imagination because I first heard about Truk Lagoon from my father who did a big trip there from the UK in the 1990’s and it’s so long ago, he dived on the Truk Aggressor, which is no longer operating I don’t think? So for him, it was the fulfillment of a lifelong ambition to visit. You can imagine in the 1980’s, well a nightmare was getting there from the UK. But to me, it was just a place that I couldn’t find on the map. So when did you first go to Truk and how did you manage to get there? [00:01:36.3] CM: And what year was that roughly? [00:01:40.1] CM: Holy moly, so yeah that was quite early. [00:01:43.4] TR: Yeah, it was quite early on and they were still doing a lot of searching for quite a few shipwrecks. There was maybe a dozen wrecks or so that had been found around that area before that and they were the go-to wrecks. They knew there were many others there but nobody really took the time to go and look and so I was very fortunate in a couple return trips. I became good friends with Kimiuo Aisek who was the scuba diving hall of fame and, the late Kimiuo Aisek I should say. His son Gradfin now runs a lot of the diving operation in Blue Lagoon but Kimiuo was the founder and the godfather of Truk wreck diving and I met him and he was working with a guy named Klaus Lindemann and they were just starting to find the other lost wrecks that everyone knew were there but didn’t know where they were basically. And so I watched as that progressed and became friends with those folks and later joined in some of the exploration. [00:02:54.6] CM: Wow, so yes you were kind of in there almost at the beginning, by accident. [00:03:01.0] TR: Yeah really. Timing is everything I guess. [00:03:04.9] CM: So it was actually in Truk that you met Klaus because you also went diving with him in Palau. So did that come afterwards? [00:03:12.7] TR: Yeah, the Palau thing came afterwards. Klaus had pretty much felt that he exhausted his searches in Truk in the late 80’s but in his book, Hail Storm over Truk Lagoon, the first edition came out I believe about 1984. So he was there looking with Kimiuo in ’82 – ’83 and his wife, Mary, was also part of the search team and they’d go out every day with some of Klaus’ research and some information from local fisherman from Kimiuo and go and check and see if they could find a wreck. And they just had pretty much the same basic equipment as they had in Palau just like a little fish finder and if they got a big hit of red, then they’d try to hook whatever it was and go down and take a look and see what they found. [00:04:08.8] CM: Wow. So yeah it was by basically the end of the 80’s that they had kind of mapped out all the wrecks were. So at what point did it begin to really take off as a destination for divers to go there? [00:04:22.8] TR: Well it was pretty popular then because in 1976 Al Genins did the big National Geographic article and it was written by Dr. Sylvia Earle and Al had the cover. Al had a big cover of the Fujikawa Maru mast for National Geographic and everybody saw this really cool mast on the cover with fish all around it and spooky looking and went, “Oh wow, we’ve got to go there,” and National Geographic back in the 70’s was the source for a major exploration. And so he also filmed the discovery of the I-196, the submarine there and did a National Geographic special as well on film. So with Al’s exposure that really put Truk on the map and it was a popular place to go. Palau was just starting to get its reputation. Nobody had ever heard it yet and Truk was the Micronesian destination to go to. [00:05:29.4] CM: I see, I guess because I am from the UK, Truk is basically the furthest point away from the UK that you could get in the world essentially, whereas if you’re coming from the US, I guess it’s not quite so daunting is it? Because you just make the hop from Hawaii. I mean it’s not particularly easy but it’s not that difficult either. [00:05:52.4] TR: Yeah, there’s always been a flight called the Island Hopper, it even exists today and it’s actually if you wanted to see what the islands look like since United has changed the schedules to make things more convenient for travelers coming from father abroad like they kind of coordinate their schedules now with Honolulu, Houston and Narita and so most people fly into Micronesia at night with the exception of the Island Hopper flight, and that leaves Guam at eight in the morning and goes all across Micronesia and then the same way it leaves Hawaii at a time that people fly in Majaro, Kosrae, Pohnpei and Truk and with an occasional stop in Kwajalein but you can’t get off the plane there. But that is a day time flight and you can actually fly in and see all the islands in their splendor and glory looking down on the beautiful lagoons and the green islands and the blue seas and the reefs. Truk is a beautiful, big, broad barrier reef and it’s pretty spectacular when you fly in and see all of that and you can even see a couple of the wrecks from the air when you fly in. [00:07:01.1] CM: Fantastic. So that was the next thing that I was going to ask you, is that say as you fly in, you get this amazing view. Obviously, the name is Truk Lagoon but a lagoon would indicate a placid body of water, but it’s a truly massive area of water, isn’t it? I mean for all those wrecks to have gone down in it, it must be a pretty big area. [00:07:23.4] TR: Yeah, it was an amazing natural anchorage and that’s why the Japanese selected it in the first place to be a big staging area for their eastern push. They flew out of Truk for many sorties and bombings around the whole Micronesia area and the lagoon itself is really stunning. There’s at least eight or nine populated islands. Tol has a population of 40,000 people, which is the westernmost island in the lagoon. And the whole area is really beautiful to see from the air because each island has its own little mountain peaks and then there are the scattered coral reefs. So you get all these beautiful different shades of blues and so yeah, if you can come on in on the island hopper then you actually get to see all of these. Most of the flights still go in at night, however. Most of them take off from Guam in about seven at night and get into Truk about nine so. [00:08:27.4] CM: Yeah, you have to choose your flight carefully. [00:08:29.1] TR: Yeah but you can also, I mean if you have a little bit of energy in between your dives a good number of these islands had the gunmen placements at the top of the island. So you can hike to the top of Etan or a hike to the top of Weno, which is where most people stay and look at the old caves that still have guns or the top of the hills that still have guns and you can get a really nice view from the top of many of these islands if you hike to the summit. The hiking really isn’t that strenuous so you can do it in between dives sometimes if you take a couple of hours off. [00:09:11.9] CM: Right and you mention that you can see a couple of the wrecks even from the air. So obviously, as I was reading there were 12 warships sunk and 32 merchant ships. So that’s over 40 wrecks and they are most presumably but all different kinds of depths. I think the perception of Truk is that it’s actually mainly for, it’s wreck-heads and it’s for technical divers, for people who like going really deep. But that can’t be the case, right? Because you can’t have all of these amazing coral anywhere less than or anywhere below 15 meters. [00:09:46.6] TR: Yeah, no that’s really not the case. Truk maybe has 10 what would be considered as deep wrecks down to maybe a 190 feet. There’s one at 210 to 220 I believe it’s Katsuragisan that was just found by Mr. Lindemann, one of the more recent finds. and the rest of them are all well within safe diving distance and really, the beauty of the wrecks is you know exactly where everything is. We call them ship reefs because the upper areas of the wrecks are covered in soft corals and many of them have hard corals growing on the deck and the bow areas and there are just clouds of fish. A lot of them were in shipping channels and so these channels have currents so you get sharks and eagle rays and barracuda schools and the Fujikawa Maru has a huge school of Jacks that they like to hang around the anchor chain at the bow. All that’s 30 meters or less the top of the deck of the Fujikawa is only about 15 meters and so anybody that really wants to see marine life, even if you’re not a wreck head, you can go onto these wrecks and be very pleasantly surprised. Some of them even have good mackerel, there’s some nudibranchs that seem to like the Sankisan a lot and if you have a diving spouse that isn’t really that crazy about shipwrecks, the spouse is going to be just as happy at looking at all the corals and the marine life. It’s great for wide angle lens for the close ups because of the beauty of the soft corals that grow on like Shinkoku and Fujikawa, even Nippo has some really nice corals so you can pick and choose your wreck and stay fairly shallow. [00:11:35.0] CM: So if you’re out there for a typical week’s liveaboard you could happily spend that whole time diving these ship reefs and not feel like you’re repeating yourself too much? Or there’s a huge variety, is there? [00:11:50.1] TR: Yeah, like the Thorfinn has, I believe they offer one of these all inclusive packages for five dives a day and so it becomes kind of a blur after a few days. As in, “What wreck was that” you know? But yeah, you’re up at seven in the morning and you do usually your deepest dive or your deepest wreck and then progressively get shallower and then there’s a night dive and the way that Lance has it set up, because there are over 40 wrecks, is you can pretty much dive a new wreck every time and go for your whole week at the Thorfinn, get into your 30 some dives and never dive the same wreck twice. [00:12:44.5] CM: Wow and in terms of the logistics of just moving around between the wrecks, are they all fairly close together? Would you just go out and chase boats from the main Liveaboard and just like a 20-minute drive over to the next wreck or they scattered quite far apart? [0:13:01.8] TR: Actually like the Thorfinn, it’s more of a floating base. It’s kind of a floating hotel and yeah, they just take the boats directly out from the Thorfinn. I believe the Odyssey actually goes and visits some of the wreck areas. The wrecks are, they’ve been under water over 70 years now and they’re a little bit fragile, you can’t really anchor on the wrecks. So the liveaboard ships don’t do that in some places, they’ve got buoys placed and they’ll use the buoys. And then there are two large land-based operations. Truk Stop Hotel and the Blue Lagoon Hotel and both of them have dive shops and they just go out from the main island of Weno every day and there are some out to the west like the Shinkoku and the Fumizuki Destroyer and also there’s another wreck, the Hanakawa that’s out by Tol. Those are maybe an hour boat ride and your typical dive boat, 45 minutes maybe. So they’re a little further out and then closer to Dublon, which was on Eten which were the big seaplane and airplane areas and a lot of ships were anchored around this areas because they had deep channels and they also brought supplies in and out to many of the troops that were on Dublon. Dublon is also known as Tonowas and so within that area, a lot of the shipwrecks are quite shallow and easily dived a little further down, you have like the Sankisan and the Rio De Janeiro, really beautiful wrecks and it gets a little bit closer to the south pass where a lot of clear water comes in, so the visibility can really be excellent on like a wreck like to Rio. Then some of the deeper wrecks are a little bit east off Tonowas was and that’s where you find the Hoki Maru, which is more like 45 meters or something like that and the San Francisco, which is the one that has all the mines on it and a couple of trucks and my favorite is the Nippo Maru which has trucks and tanks and a really nice bridge area, lots of marine life and you can go 40 something meters on that wreck, you don’t have to, the average dive on that is probably about 30. [0:15:28.9] CM: Wow, yeah. That seems to be, the Nippo Maru is one that seems to come up a lot as you really have to see it. Are there any particular wrecks that irrespective of whether or not it’s like a super-duper for photos but it’s just a personal favorite of yours? [0:15:44.0] TR: Yeah, I really do like the Nippo even though your bottom time, it normally isn’t that long. We see eagle rays on it and Barracuda schools. So you have a lot of nice marine life, there’s the tank on it and the trucks and then there are some field artillery guns, so you get that real war feeling, that wreck feeling. The bridge is really beautiful, the old ship’s wheel has a lot of nice sponge growth on it, usually a lot of small baked fish inside the upper part of the bridge. So not only is it photogenic but it’s kind of exciting and it’s just deep enough that you feel like you’re really down there exploring something. [0:16:24.1] CM: Yeah, that sounds fantastic. As well as these wrecks and you talk about like moving a little bit further out, are there any dive spots around there that have no wrecks that are just pinnacles or whatever are great for the marine life? I heard there are some pretty good shark spots. Or there were some exploratory dives looking for shark spots. Did sort of anything come of that? [0:16:46.1] TR: Yeah, there are sharks there. The funniest story I heard was quite a few years ago that there were three German photographers that kept on wanting shark pictures and they took them over to at that time I think it was the Shinkoku had a little white tip living on it and they weren’t satisfied with just one little white tip. So Kimiuo Aisek told one of his staffers to take them out to the north pass and see if they could get some sharks out there. They were readying their cameras and talking about sharks and very excited and he got out to one area at the north pass, which is a good ways out, it’s about an hour and a half by boat to get out to the edge of the outer lagoon. He said that, “Just wait for a second and I’ll jump in and see if there are any sharks,” and the German guys continued to ready their cameras and about two minutes later, they heard a splash and they saw two hands on the side of the boat and then completely pulling himself out of the water, the dive guide pulled himself in and crashed to the bottom of the boat and as he was doing that, a shark came up and grabbed his fin and took a quick little bite out of it and went back into the water. And the three German guys sat there and were looking at him and said, “The sharks are here and they’re ready for you.” At which time the German guys decided they’d go back and shoot the white tip on the Shinkoku. [0:18:27.4] CM: Fantastic. So yes. [0:18:30.1] TR: Right now they have an area that the liveaboards use at the south pass and it has tons of gray reef and every once in a while some silver tips come in and you get your little white tips swimming around there, it’s a good sharky spot. Then there’s a fantastic place that Truk Stop uses quite a bit. It’s on the northeast side of Weno Island and it’s called, oddly enough, Shark Island and the sharks come in here and actually there is a cleaning station and it’s a fairly reliable event where they come in about 11 in the morning and it’s mostly a gray reef shark and, you know, do the posture and you can see the cleaner grasses going in and out of their teeth and many of them come in and circle around and get this done. So after that, sometimes they’ll follow you over to the boat so it’s a very good place to get shark photos and unusual shark photos as well. [0:19:29.1] CM: Yeah, fantastic. It’s great to think of the area being this sort of marine sanctuary and obviously, because it’s in such an isolated spot in the ocean, I guess it just attracts so much marine life to it because it’s a shelter for them. [0:19:43.1] TR: Yeah, the terrain within the lagoon is really varied and you see turtles, there’s a couple of islands that have small little lodges on them that have really nice little beaches and reefs and sometimes you see the turtles up on the beaches there and while the Truk Lagoon, or the state of Chuuk, is a rather poor island most people use subsistence fishing. You really wouldn’t call it like marine preserve area but it’s just so rich and it’s you know, varying terrains and diversity that there’s a lot of marine life that you’ll be able to see, breeding areas, there are some places that have mandarin fish, if you’re kind of all wrecked out and want to look for some reefs, they have some nice reefs out there. Then on top of it, Blue Lagoon has a couple of private islands that you can go out to, the most popular one is Jeep Island and a lot of people, especially Japanese in the summer time, go out there and they don’t go out for the wrecks at all. There are some bottlenose dolphins that come in the summer time and they go out to be able to try to swim with the bottlenose dolphins or at least observe them and just do a little snorkeling trip to some of the nicer reefs. Jeep Island has a huge patch of staghorn coral, it’s all full of chromis fish and everything. It’s really a very pretty little coral garden on one side of the island. Jeep Island is a tiny little place. It’s got like 15 coconut trees and you can walk around it in about three minutes and so when you’re out there and there’s just like one little house that’s like a tatami house where everybody kind of shares one big area. Then another little area for cooking where there’s a Chuukese couple that lives there and cooks meals for people. So it’s a really out there kind of nature thing with the waves lapping up against the beach and the stars out at night and the Milky Way, it’s a beautiful place to spend a few days and totally away from the wreck experience. [0:22:07.6] TR: That’s really true and actually, I believe the visitors bureau is slowly but surely trying to develop some other islands like this. Like I said, Blue Lagoon has one other island that you can go stay on, it’s more of I think for couples to stay on, kind of a romance island. And I know there are two or three other islands that the visitors bureau there has been targeting to try to develop in the same way, that you can at least go to for day trips and they can arrange for overnights and have food for people and that sort of thing so they can kind of have an island experience. When you actually see the vastness of the lagoon, there has to be at least a hundred little islets that surround the entire outer barrier reef lagoon and they all have the nice white sand beaches and coconut trees and it’s pretty idyllic. So that aspect, yeah that’s something that people really don’t think about and it seems like it’s more some of the Asian tour companies have picked up on that and bring people in for that. [0:23:12.4] CM: Yes, so that side of it is kind of the tourism there if you want to say like the land tourism or the island tourism, it’s in its infancy so now is the best time to go and see it I guess, there are not too many people out there. [0:23:25.4] TR: Yeah, I mean, Truk I believe gets less than 5,000 visitors a year. [0:23:32.3] TR: That’s good for Micronesia but compared to Bali that’s shooting for 19 million and by 2025 or something. It’s a much more relaxed, a much different experience and I think people tend to like just the slowing down and the lifestyle. The Wi-Fi there isn’t so great and so you can kind of get away from it all if you want to get away from the internet. You can still send emails and check on sports scores and stuff like that, but you won’t be tied to your cell phone or your computer, you can just kind of go diving and do and see what nature intended. [0:24:17.0] CM: Jumping back to the wrecks, you mentioned earlier that the wrecks were obviously 70 years old now and like the Fujikawa Maru, apparently last a couple of years, some of the superstructures started to collapse. Therefore with doing penetration dives into the engine rooms and so on and so forth, is that something you personally enjoy doing or is it something you stopped doing or what do you think the situation is with that now? [0:24:43.7] TR: Well actually the problems that’s stemming from the Fujikawa and a lot of the other wrecks are either weather related, we don’t find the actual insides of the ship to be as affected as some of the outer areas like some of the rails around the bow of the Fujikawa. People used to anchor on those all the time and over the years, the stress from that caused some of the marine life to scrape off and because of that, it kind of exposes the metal, which caused the rails to either break away or rust away. And the same thing happened with a few typhoons. There were some very strong swells that came in that caused the wooden boxes that were holding a lot of the ammunition, there’s a huge amount of ammunition on the Sankisan. The Sankisan is actually only half of a ship because a lot of that ammunition blew up when it was attacked. All those boxes just kind of fell apart and so now there’s a whole holds with just bullets everywhere around but they all used to be in boxes at one time but the big swells that came in actually shook the ship enough to make the boxes fall apart. So yeah, just a lot of it is over time but actually going down into the holds and down into some of the engine rooms, I still find if you’re with a good guide, the ships have held up long enough that you can do penetration dives and just the guides know this ships like the back of their hand so just kick very lightly and follow the guide and you’ll be just fine. [0:26:21.9] CM: Right, the other thing as well, it’s obviously important to remember is that all of these wrecks are still war graves, so for divers that have never been there before, you see occasional photos of gas masks and sometimes even skulls. Is that something that is encountered, human remains? Is that something that’s encountered very often or is that only in a couple of wrecks? [0:26:43.5] TR: Yeah, it’s only in a few wrecks because back in, it was late 80’s, early 90’s, the Japanese are repatriation teams came out and took quite a few of the remains of their sailors and soldiers off the wrecks and built a big funeral pyre and burned all the bones and then the ashes were taken back to Japan in a rather solemn and large ceremony that was held on Weno. Most of the wrecks say you don’t really see a lot of the bones anymore. In the 80’s you used to but since his teams came in and did that for their people that you just find a couple where there’s an occasional skull still on the wrecks that the guides can point out to show you that yes it was war time and they were victims of war, still on the wrecks. There’s a rather deep wreck, there are very few people visit called the Oite and it still has a lot of remains just because it’s 220 feet and very few people visit this wreck and it was a small destroyer and it was trying to leave the lagoon, came back in, another destroyer got shot and those people were sinking and so those people got on the Oite so there were two full crews and then the Oite finally got sunk. So quite a few people went down with that ship and I don’t believe anyone’s been taken off of that ship but very few people visit it now just mostly rebreather divers. [0:28:21.5] CM: Is there any kind of commemoration ceremony each year on the anniversary of the Truk attack happening, which is February? [0:28:29.4] TR: Yes, there usually is, there usually have some sort of ceremony that goes on there and many of the ships also have small monuments placed on them to either remember the crew or there’s even one to remember Kimiuo Aisek who was the pioneer of all the wreck diving in Truk, and there’s one for him on the Fujikawa Maru. The people are remembered, yeah. In fact, their war graves are not forgotten there. [0:28:57.4] CM: Okay, and speaking of times of the year, when is the best time of the year to go diving Truk, is it seasonal? [0:29:04.6] TR: Because there are so many islands, you can kind of hide behind the islands to get away from the wind. The trade wind season is kind of from December through about May in Micronesia and it seems like the winds like to whip up a little bit in March over in Truk, but on the whole, you won’t get skunked if you go there, unless an actual typhoon hits, which is really rare. You can go year round if you want to get out to some of the further wrecks, you need to kind of flat ocean, starting in June and then heading into August and September especially, it’s rainy season. So you might get a little wet but usually, the lagoon is kind of glassy flat. So then you can get out to some of the far islands. There’s a western island that has a bunch of gun emplacements on it that’s out by the western passage and you can also get to some place I got to Tol, like for the Hanakawa Maru to dive on that. So if you want really nice calm conditions, people recommend September and even into October. Although you might get rained on a little bit but you can really dive year round in Truk, you don’t have to worry too much about anything that would prevent you from going to some of the wrecks. It might just be a little rougher ride because the waves area a little bigger. Because it is a really big lagoon, but there are some places where you can hide behind the islands to get a nice smooth ride and then just kind of pull around the corner and the guide throws the anchor out or hooks up to the buoy and you go down real quick, so it’s not really that hard. [0:30:44.9] CM: Sure, in general, what’s the visibility like? Is it very changeable or is it tend to be sort of fairly consistent? [0:30:52.4] TR: It does kind of change and it all depends on where the ship is located. Some of them are located in channels with currents and close to mangroves or close to river outfalls. So those ships kind of vary in visibility and the ones that when we see something like the Heian Maru or the Kansho Maru, they’re fairly close to some mangrove areas. So you might find them a little siltier or in the visibility a little bit lower. And then you get down by the south pass, Sankisan, there’s a couple of other small warships and Rio De Janeiro. They’re usually crystal clear all the time because they get a big tidal flow coming in and out of that pass. Some of the deeper wrecks also are in areas that don’t really have a lot of current flow so they tend to be rather clear which is kind of spectacular when you hit about 30 meters and maybe hit the first mast and start seeing the whole ship come into view then that’s pretty spectacular. [0:31:55.6] CM: Okay, finally, you’ve mentioned quite a few of the liveaboard and the resorts that are in Truk. Do you have a preference in terms of which is easier to dive with from a liveaboard or is it much of a muchness? [0:32:10.6] TR: I really don’t. The Odyssey I think tends to accommodate a more technical diver. So if you’re a techie kind of guy, maybe you’d want to go on The Odyssey. The Thorfinn has a package deal. So I think if your idea of diving is getting as many wrecks in one week as you can, maybe you do a Thorfinn package. And then I prefer the land base myself and that way I can do just about any wreck that I want depending on the day. That would be Blue Lagoon or with the Truk Stop guys. Blue Lagoon is the old continental hotel grounds and it’s a really beautiful setting with nice palm trees and a really big area. So after the diving, it’s nice to walk around the grounds and sit on the beach there and then Truk Stop is in town so it’s really convenient if you want to go buy snacks or something like that. They have a really nice little pier and bar and I think they have the Hard Wreck Café or the Hard Wreck Bar or something like that. [0:33:23.8] TR: So it’s not bad either. [0:33:25.8] CM: Yeah, well, I have to say, Tim, I’ve always wanted to go there but after this conversation, I sort of think I want to make my plans for next year now because yeah. There’s a lot of conjecture about whether the wrecks really are going to completely collapse and that they’re going to start releasing oil and all this kind of disaster scenarios. Do you think that’s feasible or do you think they’re just going to be there for another 20, 30 years at least? [0:33:49.5] TR: Well, they’re not getting any younger but they are in protected areas, which is why they were where they were in the first place. So it’s not like they’re on an outer reef getting banged by waves all the time. So yeah, I’d give them another 20 years at least. Some ships were converted into freight and warships and were built in the early 1900’s and they’re made of pretty strong and, you know, the craftsmanship was good, the metal was good and the proper time was taken for them to be built because many of them were passenger ships before they got converted. Some of the newer ships, they were built pretty quickly, the metal that was used for them wasn’t as good and they’ll probably see the stress and probably be collapsing first, there’s already two like that I think at least one has pretty much fallen apart. And there’s a couple more that are, like the old gunship that’s fairly famous photo where people used to snorkel on the gun. The gun hass actually fallen off that now and there’s not much left of that. It just kind of depends on which ship it is but then I think there’s another 20, 30 years of wreck diving before anybody has to worry. Just as long as the marine life stays on the wrecks, it actually kind of acts as kind of an outer coating that holds everything together. As long as people keep protecting the wrecks and not anchoring on them and letting the marine life and the coral kind of grow together, it kind of fuses the ship and becomes a reef. So I’d say, you know, go and not worry much about the timetable but it’s just good to know that it’s the best of both worlds. If you’re really into wrecks, you’ve got it all there, and there are still a lot of artifacts on the ships and if you’re really into reefs, well just swim above and you know, go where the corals are and you’ll be able to see some really nice stuff there. [0:35:56.6] CM: Awesome, thank you so much, Tim, it’s really good to have this chat with you and yeah, it does sound really exciting, I’d love to go there. [0:36:03.5] TR: I think you need to go. [0:36:05.9] CM: All right mate, thank you very much.